What is one of the biggest challenges faced by sports organisations and digital agencies today? Finding the balance between delivering a page in seconds that is also beautiful, packed with captivating imagery, bursting with stats, historical records, video and exciting features. It doesn’t matter how fabulously feature rich your site is, if your pages are slow to load no one is going to see your hard work. Whether that’s because it’s not fast enough to rank highly on search engines or because visitors ever-decreasing attention spans (at 8 seconds they are less than that of the lowly goldfish) mean that we bounce off the page before it loads, the result is missed opportunities through lost web traffic and potential sales, and disappointed fans. There are many areas that impact on site speed and are a great way of finding the balance between a beautiful page that also loads quickly. A number of them are highly technical but there’s also a good old dose of common sense involved and a few areas where clients in particular can exert influence. SEO is important to everyone, identify which pages are the most influential in terms of bringing organic traffic to your site and specifically target them for low load time by minimising complicated design elements. With our sporting clients, the fixture/results list is often one of the pages that generates most traffic from organic search. Six Nations Rugby are in an extremely competitive market for their fixture information even with Google’s OneBox, so we focused on keeping the page as lean as possible and employed structured data markup on the page to increase the ranking and to ensure that we were delivering the information the fans most wanted, quickly. Imagery is critical on a sport website. It captivates and engages the visitor, evoking all kinds of emotions and memories for fans. Sports organisations tend to have access to lots of great photos but too many images, or images that are not optimised properly will seriously slow your website down. 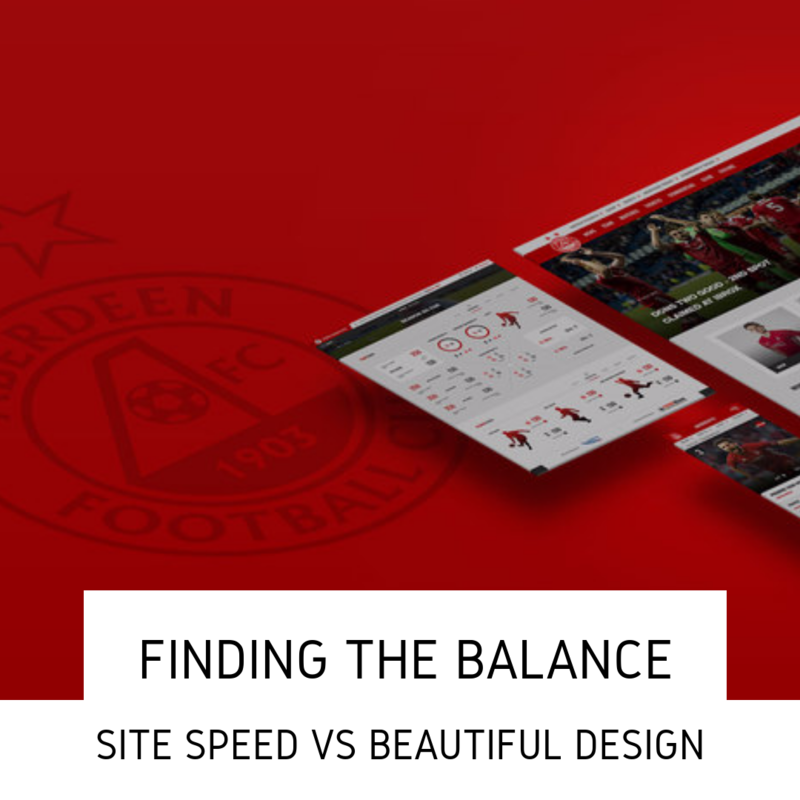 At Sotic we ensure that we’re using responsive images, which are properly optimised to the screen on which they are being viewed as a matter of course, our work with Aberdeen Football Club is just one example of this, and we try to avoid the use of heavy background imagery on site design. But I’d challenge staff working at clubs, governing bodies or federations to also think carefully about how and where images are used on the site and use analytical tools such as heatmapping to inform your decisions. You might really want to display a beautiful selection of player or athlete images in a photo gallery towards the bottom of your site, but if heatmapping shows that few users ever scroll that far then consider moving the gallery to its own page, rather than add load to all pages for little to no gain. Any external content loaded into your website from a third-party such as tracking code or social media walls will slow the experience for visitors. If you want to include the colour of the conversation with a social wall, you can reduce load time by displaying just one post from each channel, and directing user to separate page if they want to load more. If you are displaying video on your site, ensure that video embeds are loaded after that page itself has loaded. The content team at Tour of Britain Cycling creates a huge amount of high-quality video during their event but we ensure this doesn’t drag down their site speed by giving users a preview image for the video on page load and then play the HD video once they click the link. Sotic loves the power we get from being a WordPress agency, benefiting from the diversity that plugins offer to our clients. However older plugins can slow a site down so it is critical to regularly review the plugins installed on your site, removing those no longer required or seeking out newer, faster alternatives. So you’ve worked really hard with your agency and you’ve got a lean, mean site at launch, but naturally there will be the need to add and change bits and pieces over time. At Sotic we regularly receive requests for a new sponsor logo here, a piece of tracking code or a few extra pages there, all of which can slow you down. So keep testing and reviewing your site periodically to ensure it’s running as quickly as possible. On your website, just as in the sporting area, speed and efficiency rule. A website should never be viewed as the finished article. Finding the balance between compelling and engaging design and good user experience through the speedy delivery of content will put your website top of the league. Leo Mindel is Technical Director at Sotic, a specialist provider of digital services, websites and software applications to the sports industry. Sotic’s clients include; the British & Irish Lions, Tour of Britain Cycling, Premiership Rugby, Ladies European Tour Golf, World Sailing and Aberdeen FC.